Production area: Town of San Marzano Oliveto, typical area of production of such D.O.C.G. Wine. Vineyards: Towns of San Marzano Oliveto, Nizza Monferrato and Agliano Terme. Pruning system is Guyot. Planted in the years of 1970, 1981, 1984. Working techniques in the vineyards: Pruning leaving 7/8buds. Activities in the vineyards are guided by a modern Biodynamic method, vineyards are certified organic by Suolo e Salute. Harvesting: Manual harvesting with baskets, followed by analysis of maturation, generally in the fourth week of September. Ruby red with shades of purple, intense and complex fragrance of cooked fruit with evident scents of cranberry, cherry and prune. It has energic tasting impact, while flavor develops with elegance and continuity. 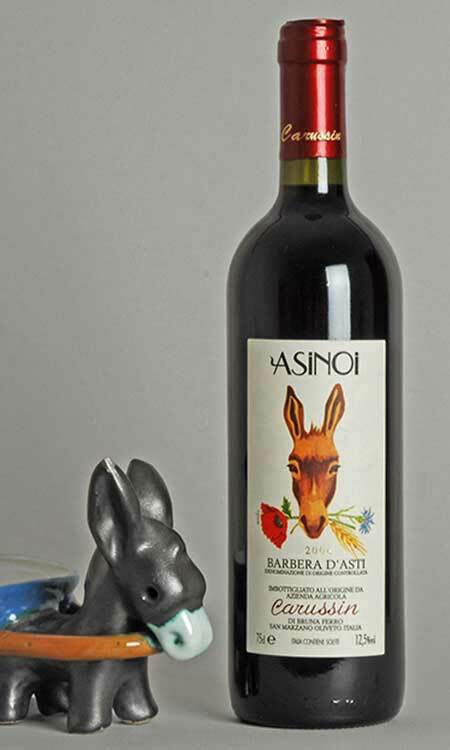 Asinoi is made with soft pressing, controlled fermentation and average maceration, wine is pumped over circa 3 times a day, wine becomes steady naturally during ageing. Short ageing in concrete tanks. Longevity: 4 to 5 years. It is a wine that pairs well with entrances, with spiced first dishes or lighter second dishes. In the vineyards: Matteo and Luigi Garberoglio. In the cellar: Luigi and Luca Garberoglio.